The horseshoe crab, though not stated in its name, is more closely related to arachnids, such as the spider and scorpion, rather than crabs. They are most commonly found near the northern Atlantic coast of the United States and the Gulf of Mexico, and have a lifespan of about 25 years. The underside of a horseshoe crab. The horseshoe crab's structure is composed of a tough outer layer covering its body that is known as its exoskeleton. This covering provides the animal with protection from predators such as the Atlantic Loggerhead Turtle. Horseshoe crabs breathe with five sets of "book lungs" that are located on the ventral side of its body. Book lungs act as gills when the arthropod is underwater, but they also allow it to breathe while it's on land for small increments of time, as long as the lungs remain moist. Five pairs of legs which are attached to the underside of it's body near the abdomen are used for both transportation and aiding in eating. Located on the tip of the thin legs are pointy pincers. Male horseshoe crabs have a large claw attached to a single leg which helps hold the female during reproduction, when eggs the female lays are then fertilized by the male then buried by the female. Like all other arthropods, this "crab" will often times molt - meaning to shed its outer layer. It does this only when the shell holding its body together on the outside becomes too small to contain its inner structure. Horseshoe crabs can grow up to about 20 inches from head to tail. The male is often times smaller in size than the female. Horseshoe crabs are most commonly found near the northern Atlantic coast of the United States and the Gulf of Mexico. They typically feed upon mollusks, annelid worms, and other benthic invertebrates. They locate their food by crawling along on the ocean floor at night, making them predominantly nocturnal animals. This varies though, as the horseshoe crab may also be found active during the day time. Predators of horseshoe crabs include large sea turtles such as the Atlantic Loggerhead Turtle. Horseshoe crab's blood, which is seen as a blue color when mixed with air, is often used in the medical field. The protein in the blood, known as Limulus Amebocyte Lysate (LAL), helps to test the bacteria that can often times be the main cause of fevers and death. Doctors also use the blood to test the "endotoxins" (bacteria) that cause the rapid growth of cancer cells. They hope to find a cure for leukemia by using the blood which reacts with the white and red blood cells in the human body. 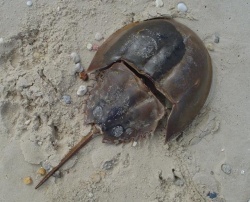 Like many plants and animals, the horseshoe crab is a living fossil. Fossilized specimens have been found that are believed to be 300 million years old, and yet are virtually identical to modern varieties. These findings are consistent with the Bible, which says that God created the horseshoe crab and all the other types of sea creatures on the fifth day of creation only a few thousand years ago. Their existence puzzles evolutionists. In National Geographic, Biologist Sue Schaller says "You've got an animal that predates dinosaurs by 200 million years, and it hasn't changed much at all. It hasn't had to evolve." A closeup of the Horseshoe Crab's legs. Notice the pincers that are attached to the end of the legs. An abandoned exoskeleton of the horseshoe crab. This page was last modified on 20 January 2012, at 20:42.